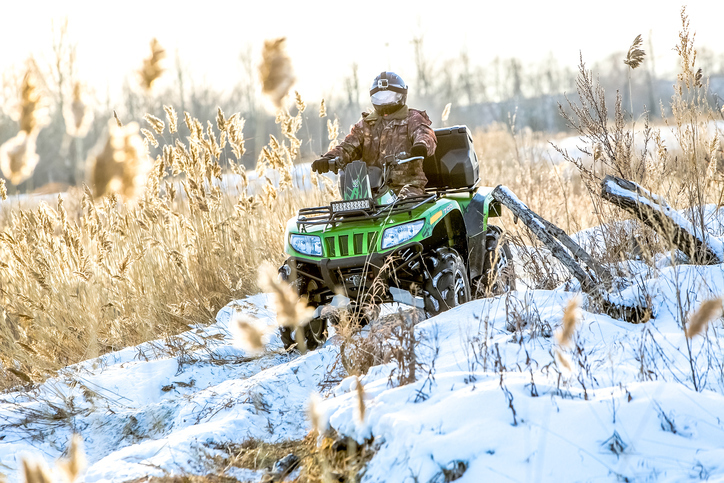 Throughout Atlantic Canada, individuals use four-wheelers and all-terrain vehicles (ATVs) as means of transportation. There are often specific routes and trails that are designated for ATVs. At intersections, motorists should yield to others who share the road. If a motorist fails to yield, it can result in serious accidents. Travel at safe speeds, at all times. Keep in mind that unfamiliar or rugged terrain could contain hazards. Avoid the use of alcohol or other drugs before or during the operation of a snowmobile. Wear well-insulated protective clothing, including goggles, waterproof snowmobile suits, gloves and boots. Carry an emergency kit. This kit could contain flares, a blanket, extra clothing, a first aid kit, a small shovel, a flashlight, roadmaps, a whistle, an extra key, a cell phone, etc. Travel in groups of two or more and only on designated, marked trails away from roads, waterways, railroads and pedestrian traffic. Check the weather forecast before going out. Avoid snowmobiling on ice if uncertain about its thickness or condition. Keep your headlights and tail lights on at all times to improve the visibility of the snowmobile to other vehicle operators. Do not carry more than one passenger & keep your snowmobiles well maintained. We recognize that you face significant hardships after a serious crash. When you retain our legal services, you can be confident that our team will work to get you full compensation. Contact Us today at 1-844-CANTINI and the team at Cantini Law|Droit will be happy to assist you. We are Atlantic Canada’s injury lawyers and focus our law practice entirely in the area of personal injury law.